The Mathare zonal development plan is a collaborative initiative by various organizations; Muungano Support Trust, Muungano wa wanavijiji, University of Nairobi and the University of California Berkeley. The plan covers the entire Mathare valley informal settlement that the planning team identifies it a zone. This plan is aimed at developing a zonal upgrading framework for Mathare valley. The theme of the plan is infrastructure upgrading as a driver to incremental complete slum upgrading. The informal settlement is located approximately 1 km from the Nairobi CBD and lies within a residential context. Mathare valley comprises of thirteen villages: Mabatini, Mashimoni, 4A, 4B, 3A (Bondeni), 3B, 3C, Village 2, Kiamutisya, Kosovo, Gitathuru, No.10 and Kwa kariuki with an estimated population of 102, 000 people. The settlement covers approximately 1.2 km2. The plan is anchored on a participatory and a collaborative approach. The successful formulation of this zonal development plan will be through an active participatory process; innovative community organization, collective decision making, stakeholder participation and not necessarily through expert urban planning principles and techniques as well as trying to innovate a pragmatic approach to slum upgrading. This participatory approach is intended to be applied at all levels of the planning process. With the presence of Muungano wa wanavijiji (slum dwellers federation) in various villages of the settlement, the technical team has developed a team of barefoot planners who have been active in the various activities of the planning process. These village teams comprise of five community members from every village and with different backgrounds and character in regards to the role they play in the community. The representation of the group is supposed to have the following types of stakeholders in the villages: tenant, structure owner, gender and the elderly. The elderly represent the local leadership structure within a village. To ensure that local governing structures are appreciated in the plan, the technical team through the assistance of community organizers has been able to bring on board local villages heads (wazee wa vijiji) as well as other leaders of various interest groups in the settlement. Even where the federation lacks presence, the local leadership has been mobilized by the federation leaders. 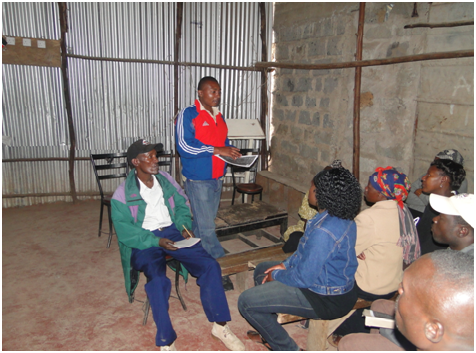 The collaborative team of MUST and UIP has successfully executed a participatory mapping exercise and a comprehensive household survey in Mathare. The other main activities that have been ongoing are; community sensitization, settlement profiling, building partnerships and technical sessions for the plan. The entire mapping exercise was anchored in the participatory process whereby data collected was through the active efforts of the technical team(Research assistant) and the community team (barefoot planners).The rationale behind this was through the notion that communities understand and interact with their spaces better and in a unique manner that can be adequately interpreted by themselves. This process was a learning experience for both categories of participants; the technical and community teams. On one hand it exposed the community team on conventional methods of understanding space through remote sensing and attribute mapping of their settlement. The mapping phase of the zonal plan was fundamental because it was intended to generating the existing spatial scenario. The mapping focused on four major components: infrastructure (water and sanitation, electricity, circulation networks, solid waste management), housing, community facilities and economic activities. Another milestone achieved by the zonal plan process in the successful execution of a household survey. This survey was commissioned to acquire socio-economical data of the informal settlement and also to add up to the spatial attribute data. In preparation of the survey, the technical team had developed a comprehensive and precise survey instrument as well as an appropriate methodology to employ/apply. The approach was formulated with in mind that the community still had to play a pivotal role in the collection of this data. The household survey was also conducted in a participatory approach where by the community team was paired with research assistants from the universities. The role of the community team was to introduce the research assistants to the residents and explain the purpose of the survey in line with the zonal plan. The community teams comprised of members living in the villages where the survey was at the time being conducted. Primarily the team was from the Muungano schemes in those villages and where the federation has no footprints, a team from the local residents was as well mobilized. In early June 2011, the three partners held a joint studio at the University of Nairobi on the plan. The studio mainly focused on refining the data, orienting the community to the planning process as well as developing various models of upgrading for the plan. The studio culminated into Mathare wide community forum where members of the community aired their expectations towards the process. The zonal plan is set to engage the community more intensively and start generating plan proposals jointly. This is a phase where all key stakeholders are set to have active participation roles in the process.